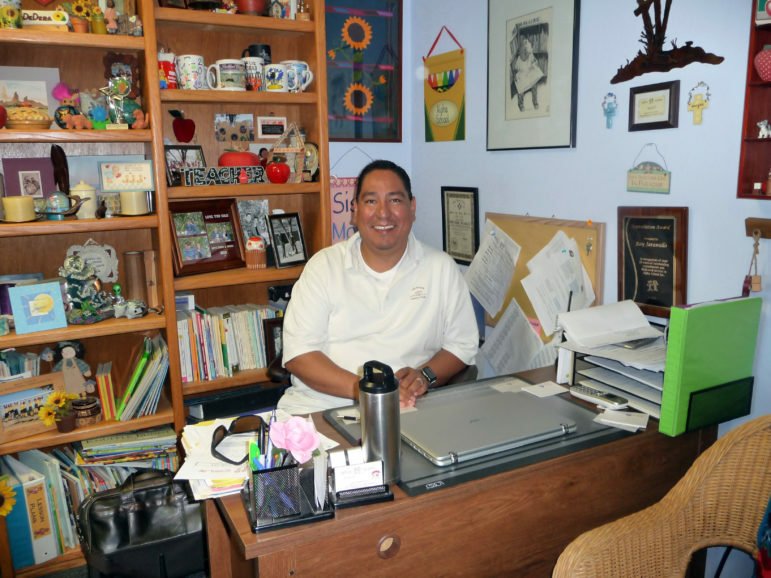 Ray Jaramillo is director at Alpha School in Las Cruces, a private provider of New Mexico PreK. He is part of a coalition of early childhood educators and advocates working for universal access in Dona Ana County. A couple of years ago a mother came to Ray Jaramillo, director of a childcare center in Las Cruces. She worked for minimum wage at Burger King, but was offered a supervisory position with better hours and a wage bump to over $9 an hour. She worried the extra money could cause her to lose childcare assistance for her two little girls. Between her and her spouse’s salary, their new earning power would push her family over the line for government-subsidized child-care. She had to figure out whether to take the promotion and risk paying thousands of dollars more each year for childcare, or forgo the extra family income. She turned down the promotion. “I remember thinking (her potential salary) was the exact same as the minimum wage was going to be,” Jaramillo said, and no worker would be able to turn down Las Cruces’ wage increase. As the Las Cruces minimum wage has risen over the past few years — from the state minimum of $7.50 in 2014 to the current $9.20 and headed to $10.10 in 2019 — childcare providers have begun to express concern that low-income families could lose valuable assistance that would more than wipe out the gains they made in wages. “My fear is that the good things we are trying to do with minimum wage are gonna hurt the exact people that we are trying to help,” Jaramillo added. That mother’s dilemma is real. It’s called the “cliff effect,” and children’s advocates say child-care assistance is the biggest loss in benefits for New Mexicans whose incomes go over 200 percent of the federal poverty level. Her circumstance is why New Mexico Voices for Children and the New Mexico Center on Law and Poverty are advocating for the state to expand the eligibility for childcare subsidies and ease the sudden drop-off of benefits as parents work their way up the income ladder. Those advocates did the math, and the good news is that Las Cruces’ minimum wage increases are likely to affect very few, if any, families that are receiving the subsidy now. That’s because about 90 percent of the people who get the subsidy are single parents, so their wage alone is unlikely to kick the family over the cliff. Armelle Casau, New Mexico Voices for Children analyst. 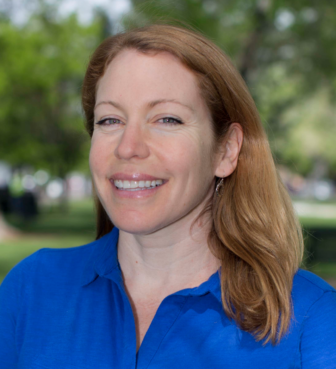 “Most families that currently have childcare would still be eligible,” said Armelle Casau, a policy analyst and researcher at New Mexico Voices for Children who is working on a report on the cliff effect in New Mexico ahead of the 2018 legislative session. The woman Jaramillo spoke about would have lost her child care subsidies because her spouse earned more than the minimum wage, and the raise would have pushed them over the ceiling of what the couple could earn while keeping their subsidies. But as the minimum wage increases, in Las Cruces and in other places around the state, the cliff effect could become a real dilemma for some two-income families. And the cliff effect jeopardizes single parents whose incomes are right on the bubble. Casau said the steepest drop in benefits as incomes rise in New Mexico is, by far, child-care assistance, a program that helps low-income parents work or remain in school. 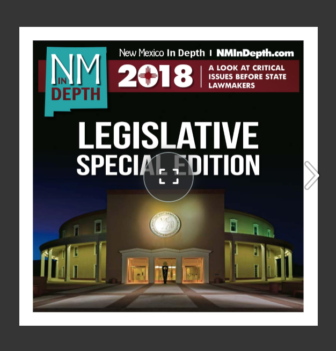 Last year, New Mexico spent about $100 million on the program with a combination of federal and state dollars, with New Mexico kicking in about one-third of the cost. It helps to think of the child care assistance program like a highway. There’s the highway on-ramp, or the amount of money a family can earn and still come in under 150 percent of the federal poverty level, and therefore qualify for the child-care subsidy. Earn more than that, and they don’t get on the highway. For a family of four, they can’t earn more than $36,903. For a single parent with two children, it’s $30,630. Once they’re on the highway, they are forced to exit at 200 percent of the federal poverty level, and that off-ramp can drive parents right over a benefit cliff. That’s because when their income rises above 200 percent, they still might not make enough to cover the very high cost of child care. For a family of four, the exit is at $49,200 in annual income. It’s $40,480 for a single parent with two children. Casau’s study looked at single parents with two kids, because most people with the subsidies are single parents and most have more than one child in daycare. She found that a typical mother could go from paying about $3,000 per year in copays to almost $15,000, the full cost if she has an infant and a 4-year-old. Even with just one child, a single parent would see a jump of up to $7,000 in child-care costs for going over 200 percent of the federal poverty level. “It’s almost like getting that one dollar increase over 200 percent FPL is a huge, dramatic loss that makes a lot of parents actually refuse pay raises and refuse promotions because they don’t want to lose that child-care assistance,” Casau said. That kind of calculus hurts New Mexico’s workforce and a family’s future earning potential, Casau says. Other programs such as food stamps, Medicaid and TANF reduce benefits more gradually as people’s income increases, something NM Voices for Children is advocating for with child-care assistance. 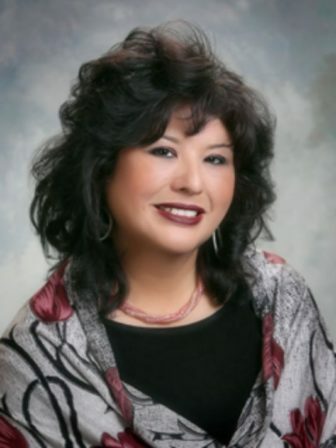 Doreen Gallegos, D-Las Cruces, House majority whip. While current families with child-care assistance in Las Cruces are unlikely to lose their benefits, some low-wage workers lost the chance to qualify for benefits when the wage went from $8.40 to $9.20 at the beginning of 2017. That’s because two parents working full time at minimum wage would make $38,272 per year, about $1,400 too much to qualify. A family of four with two parents working at Santa Fe’s minimum wage of $11.08 also would not qualify for childcare assistance because their combined income is over 150 percent of the federal poverty level, the level New Mexico sets for families to qualify initially. On Jan. 1, 2018, similar families in Albuquerque will be affected when the minimum wage increases to $8.95 per hour. Both the Center on Law and Poverty and Voices for Children said the child-care subsidies are the best way to bolster today’s workforce — working parents — and New Mexico’s future workforce, because studies have shown children with high-quality early childhood care and education have better education outcomes. Increasing numbers of New Mexico families are using the childcare subsidies at four-star and above childcare centers. 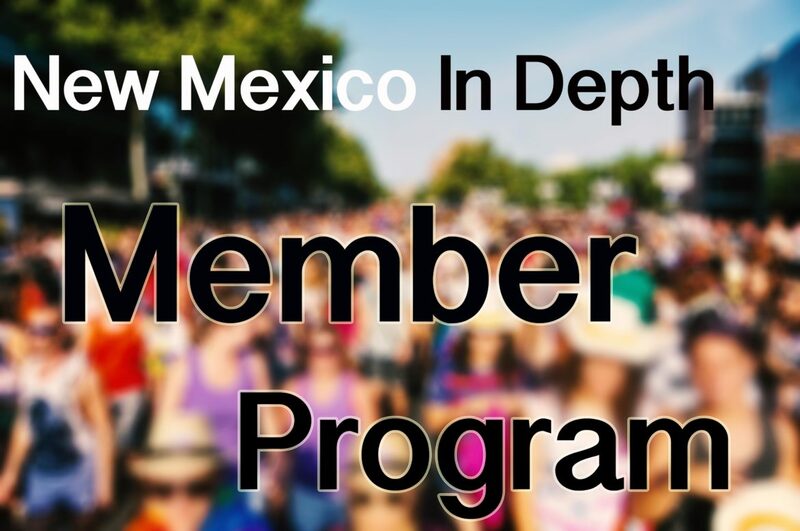 As cities like Albuquerque, Santa Fe and Las Cruces work to improve wages, more families, though, will lose the chance to enroll in the program. That delicate dance is something that could inform efforts to raise the minimum wage statewide. “We have to raise the minimum wage, but we also have to make sure the legislation doesn’t hurt families,” said Doreen Gallegos, D-Las Cruces, the House majority whip. Voices for Children and the Center on Law and Poverty believe there is a way to raise the minimum wage statewide, while still making sure more people can take advantage of child-care assistance and slowly ramp down benefits. The advocates said the best way to mitigate the cliff effect would be to take the child-care assistance eligibility level to 200 percent of federal poverty level and to increase families’ copays on a sliding scale until they earn their way off the benefit at 300 percent of federal poverty level, which would allow for a much more gradual reduction in benefits. Casau said Colorado is a high-wage state that sets its eligibility level at 300 percent of the federal poverty level and that many states go above 200 percent. “And they’re paying their childcare workers a lot more than we are. So they’re finding a way to make it work,” she said. Even New Mexico had set its eligibility level at 200 percent of the federal poverty level in 2009, before budget constraints led the state to lower it to 100 percent in 2013, and back up to its current 150 percent in 2014. CYFD will also temporarily raise the eligibility level when there is funding available to add people on the waiting list who are just over salary limit. For the upcoming budget year, CYFD is seeking $25 million more from the Legislature in the upcoming budget to pay for higher reimbursements to child-care centers because of quality initiatives and longer enrollment periods. With only about $199 million in projected new money, that’s where the rubber will meet the road. “All these legislators sit up at these panels, sit at the Kids Count, and say ‘early childhood, early childhood, early childhood.’ Let’s see if they get the $26 million,” said Jaramillo. One school of thought is that cannabis, or marijuana, is relatively benign and ought to be legalized, regulated and taxed to spur economic growth and end the harm caused by criminalization. An opposing viewpoint is that it’s a dangerous drug that needs to re-main unavailable legally, with criminal punishment of those who break the law.